These two statues are of the goddesses Epona and Brigantia. There are part of the Celts: Art and Identity exhibition, which is on at the British Museum at the moment. I went to see it last week and this was among the photos I took while I was there. 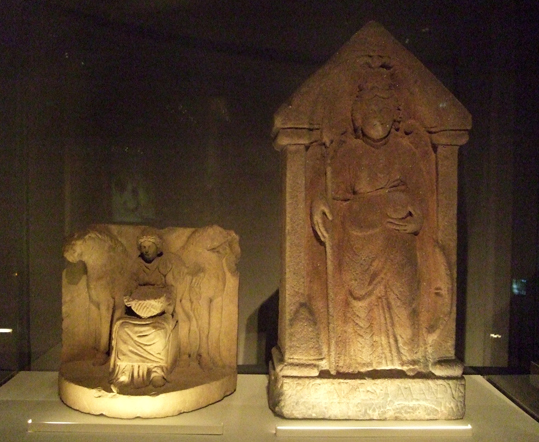 Both statues show a mixture of Celtic and Roman influence. The description next to the image of Epona said: "Epona was an ancient goddess of horses whose name comes from the Celtic word for horse. She was first shown in human form in the Roman period. Epona became extremely popular with the Roman cavalry, whose horses could mean life or death to them in battle." The statue of Brigantia came from an altar at a Roman fort north of Hadrian's Wall. Although Brigantia was a goddess worshipped by the Brigantes, people living in northern England, the style of the statue is more classical Roman than Celtic.